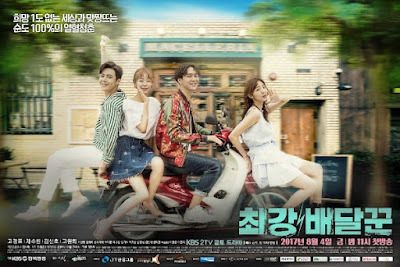 Strongest Deliveryman (Hangul: 최강 배달꾼; RR: Choegang Baedalkkun) is 2017 South Korean television series starring Go Kyung-pyo, Chae Soo-bin, Kim Seon-ho (ko) and Ko Won-hee. It premiered on August 4, 2017 and airs every Friday and Saturday at 23:00 (KST) on KBS2. Plot: Story about Choi Kang-soo, a deliveryman who eventually becomes the CEO of a delivery app company; and his road to achieving love and success.